On a small rocky peninsula at the north end of Loch Awe, the ruins of Kilchurn Castle present a sight that will have you reaching for your camera. 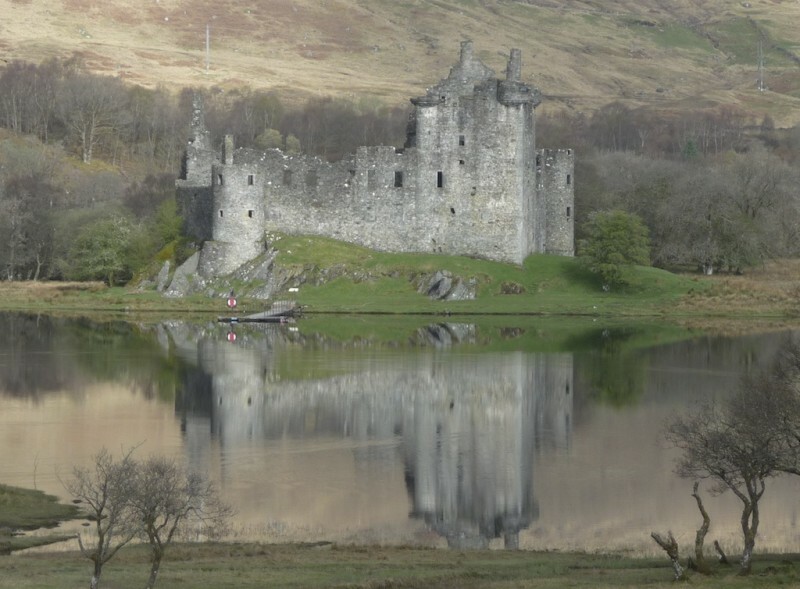 Kilchurn was built around 1450 by Sir Colin Campbell, the first Laird of Glenorchy. Originally the castle consisted of a five-storey tower house with a courtyard, but soon an additional range and hall were added to the south side, and further improvements were made over the next 200 years. In the second half of the 16th century another Sir Colin Campbell, the sixth Laird, added circular corner turrets, most of which still survive. In 1681, Sir John Campbell of Glenorchy became the first Earl of Breadalbane, and he soon saw the potential of Kilchurn as a garrison for troops. By 1689 William and Mary had ascended the thrones of England and Scotland, and the country was divided in loyalty between the deposed King James II (who was a Catholic) and the new monarchs, who were Protestant. Although Sir John was certainly a forward thinker, his plans didn’t take off as he had hoped; in 1698 the English government decided to convert the buildings at Fort William, about 70 miles further north, into a garrison instead. 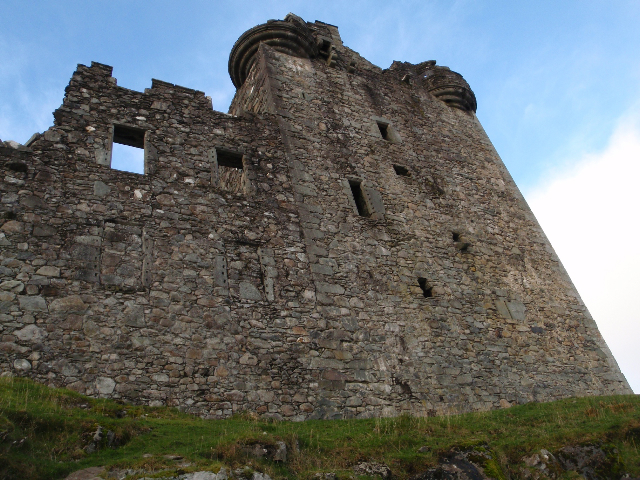 During the Jacobite uprisings of 1715 and 1745, Kilchurn was used to house troops loyal to George I of England, although Sir John did not live long enough to see this. The Campbells moved to Taymouth Castle in 1740, and 20 years later Kilchurn was badly damaged by lightning and abandoned. In fact, one of the turrets was blown off its tower and still rests in its landing place, upside down, in the centre of the courtyard. At the time of its construction, Kilchurn stood on an island, because the water level in the loch was higher than it is today. Back then, the castle walls must have appeared to rise vertically from the water. Loch Awe is an inland, freshwater loch, and the drop in water level was caused by a clearance of the loch’s outlet in 1817. Since 1770, Kilchurn has been roofless and unoccupied, with the exception (according to Scottish Field magazine) of an eccentric elderly lady known as Kate nan Con (‘Kate of the Dogs’). She must have been an interesting character. Now in the care of Historic Scotland, the castle can be accessed via a path and walkway from the A85, or by boat from Loch Awe pier. So, the question we’re dying to ask: are there any hauntings? The Paranormal Database – don’t you wish you had one of those? – says that in April 2010 some visitors heard someone walking across the floorboards in a turret above their heads… but, of course, when they climbed up to see, no one was there. I’ve seen Kilchurn in all weathers and in all seasons, but I think it looks most dramatic in winter, with the first snow lying on the surrounding summits. These photos make a surprising contrast with the mellow image that we took in April this year, of mist rising from the loch against a golden sunrise. It’s sad to see it in ruins, but what a thing it must have been in its time. I love history, thank you for this wonderful opportunity to see and learn something new. Glad you liked it… it would be lovely to see what Kilchurn was like in its heyday, and all the other castles, come to that! On the other hand, not having armies marching from castle to castle attacking them like there were during their heyday is probably a good thing. That’s true. Attacking armies must have been a nuisance! I would love to visit Scotland someday to see these sights! Hope you get the chance to do so… you would have so much inspiration! What incredible scenery- and the history on top of it is a great bonus. Thanks for the article! A pleasure! There are so many more such places.